Brexit: Theresa May Goes Greek! -Will Parliament Save the Kingdom? While the name has not changed; the definition certainly has. It has become all too easy for democracy to be turned on its head and popular nationalist mandates, referenda and elections negated via instant political hypocrisy by leaders who show their true colours only after the public vote. So it has been within the two-and-a-half year unraveling of the UK Brexit referendum of 2016 that saw the subsequent negotiations now provide the Brexit voter with only three possibilities. All are a loss for Britain. One possibility, Brexit, is the result of Prime Minister, Theresa May’s negotiations- the “deal”- and currently exists in name only. Like the PM herself, the original concept of Brexit may soon lay in the dust of an upcoming UK Parliament floor vote in exactly the same manner as the failed attempt by the Greeks barely three years ago. One must remember that Greece on June 27, 2015 once voted to leave the EU as well and to renegotiate its EU existence as well in their own “Grexit” referendum. Thanks to their own set of underhanded and treasonous politicians, this did not go well for Greece. Looking at the Greek result, and understanding divisive UK Conservative Party control that exists in the hearts of PMs on both sides of the House of Commons, this new parliamentary vote is not looking good for Britain. The Fleeting Illusion of Election Night Victory. Similar to Greece, the current state of Brexit leaves it now before the parliament – not the voters- as a poor Hobson’s choice. In a week, this faux- Brexit as it is currently- the spawn of an utter, and possibly deliberate, failure in the negotiations- will be decided. Here in the UK blame can be laid at the feet of just one national politician, who, like Greek Prime Minister Alexis Tsipris, first appeared to their desperate country dressed in the mantle of “Hope” and “Change.” Too quickly Tsipris was stripped bare, following Syriza’s staggering 2015 national election victory and his subsequent tepid and inept attempt to renegotiate with Brussels about its destructive debt structure and leave the EU. His public disrobing then- like that of UK Prime Minister Theresa May via her “deal” – would thus reveal the life-long scars of their true national allegiance gnawed into their backs by the lust of their masters in Brussels. On Dec. 11, 2018, the most historic vote in modern UK history will take place. At stake is Britain. Like Greece, the whispered coercions to UK Parliament members by the arrogant likes of European Commission president, Jean-Claude Juncker and President of the European Council Donald Tusk and their EU members have begun. These are the men who have already beaten back the democratic attempts of Greece and Catalonia while affecting recent populist socialist movements in national elections in Italy and in Spain. As must be remembered, David Cameron, a Tory, called for the national Brexit vote in order, not to free the UK from the clutches of EU unelected dominance, but instead to further certify and strengthen the Conservative Party’s ongoing destruction of the UK’s social services, privatization of national assets, privatization of Britain’s healthcare system (the NHS), and increased austerity for UK families. All this, while an increasingly impoverished Britain saw their parliament approve tax cuts for the wealthy and corporations, benefit reductions for workers, increased retirement age, and more funding for US/Israeli inspired wars under diktat from Brussels via Washington. Ironically, like a cluster bomb of white phosphorous over a Syrian village, Cameron’s Brexit vote blew up spectacularly in his face. Two decades of ongoing political submission to the EU by the Cons and “new” labour had them arrogantly misreading the minds of the UK voter. So on that incredible night, it happened. Prime Minister David Cameron… the Cons… New Labour…The Lib- Dems… and even the UK Labour Party itself, were shocked to their core when the unthinkable nightmare that could never happen, did happen. Brexit had passed by popular vote! David Cameron has been in hiding ever since. After Brexit passed the same set of naïve UK voters assumed, strangely, that Brexit would be finalized in their national interest as advertised. This belief had failed to read Article 50– the provisos for leaving the EU- since, as much as it was mentioned, it was very rarely linked or referenced by a quotation in any of the media punditry. However, an article published four days after the night Brexit passed, “ A Brexit Lesson In Greek: Hopes and Votes Dashed on Parliamentary Floors,” provided anyone thus reading Article 50, which is only eight pages long and double-spaced, the info to see clearly that this never before used EU by-law would be the only route to a UK exit. Further, Article 50 showed that Brussels would control the outcome of exit negotiations along with the other twenty-seven member nations and that effectively Ms May and her Tories would be playing this game using the EU’s ball and rules, while going one-on-twenty-seven during the negotiations. In the aftermath of Brexit, the real game began in earnest. The stakes: bigger than ever. Forgotten are the hypocritical defections of political expediency that saw Boris Johnson and then Home Secretary Theresa May who were, until that very moment, both vociferously and very publicly against the intent of Brexit. Suddenly they claimed to be pro- Brexit in their quest to sleep in Cameron’s now vacant bed at No. 10 Downing Street. Boris strategically dropped out to hopefully see, Ms May, fall on her sword- a bit sooner. Too few, however, examined this reality once these political Chameleons changed their colours just as soon as the very first results shockingly came in from Manchester in the wee hours of the morning on that seemingly hopeful night so long ago: June 23, 2016. For thus would begin a quiet, years-long defection of many more MPs than merely these two opportunists. What the British people also failed to realize was that they and their Brexit victory would also be faced with additional adversaries beyond the EU members: those from within their own government. From newly appointed PM May to Boris Johnson, from the Conservative Party to the New Labour sellouts within the Labour Party and the Friends of Israel, the quiet internal political movement against Brexit began. As the House of Lords picked up their phones, too, for very quiet private chats within House of Commons, their minions in the British press began their work as well. Two weeks ago, Ms May announced the details of her very much anticipated “deal.” This was the culmination of her “tough” negotiating style with the European Union negotiators on Brexit. The definition of pro-Brexit supporters in Ms May’s Conservative Party has amounted to two possible choices in result: the “hard Brexit” which completely severs ties with the EU. This would separate British law from European law on topics ranging from trade to migration to product regulation. The other strategy, a “soft Brexit,” would maintain some of these ties without a complete separation from the EU’s common market. The details that Ms May released on Wednesday are without a doubt a very soft Brexit- one that pays no homage to the original vote. This is because the deal has a provision that would still keep the UK in the EU Customs Union (the system setting common trade rules for all EU members) indefinitely. This is an outrageous inclusion and betrayal of a real Brexit by Ms May since this one topic was the most contentious in the debate during the ongoing negotiations because the Customs Union is the tie to the EU that the original Brexit vote specifically sought to terminate. Worse, this deal would have the UK parliament forfeit its current direct rights to EU law and courts in the advent of problems within the Customs Union after the deal. However, Britains are supposed to believe the protestations, now, that the EU will promise to provide smooth sailing from now on. The issue of the “Back-stop” has Ireland furious as well. This is designed to avoid a crisis over Northern Ireland, which is part of the UK but wants to retain an open border with neighboring EU member Ireland. Imposing border controls between Ireland and Northern Ireland could threaten the Good Friday Agreement, the deal that ended serious violence in Northern Ireland in 1999. Unlike, Ms May, Ireland does not trust the EU. Due to the Back Stop and the Customs Union, the EU will be able to force its will on the UK, as France has already said it will do over fishing rights, but the UK will not be able to cry foul, because Ms May will have given up the nation’s EU commercial rights of any kind over grievances. When, on Thursday, PM May went to Parliament to defend her deal, she was met by howls of laughter as she attempted to show confidence before the whole House of Commons when defending her indefensible deal. Next, Tory Jacob Rees-Mogg, who has grandstanded throughout as an MP from the hard Brexit camp, submitted a letter of no confidence in May’s leadership — which may see her soon join David Cameron in hiding. As it stands before parliament next Tues., the choice is a Hard Brexit “No” vote or “Yes” to Ms May’s excuses for this deal. This choice also amounts to whether she will see her hand the keys to No. 10 over to the nightmare of Brussels, Jeremy Corby. Both sides predict gloom and doom for Britain, and here, they may both be correct. This all the more highlights the failure and the treason of Ms May’s deal. The last option is a new Brexit referendum. After a successful “No” vote. “The prospects of a second referendum have advanced considerably,” wrote the ultra-conservative Financial Times’s Robert Shrimsley, who added. “Parliament will not stomach a no-deal exit. So the hardliners risk provoking the crisis that kills their dream, by smoothing the path to a second referendum.” This, of course, ignores Junker’s threats against further negotiations and the very questionable outcome from the voters who are tired of elections and this Brexit but will likely, then, have a new leader in the Commons. As it stands, only one possible outcome, the “Hard Brexit,” is in keeping with the spirit of the Brexit that was voted for long ago. But if the fate of Greece is followed by EU vengeance on the UK in retribution, the Brits will be hit hard, fast and often. Considering the Tories, not surprisingly, have no plan for this, the pound will likely dive and prices soar in Venezuela style fashion. The deal, however, is a clear victory for the EUP and a new referendum as no guaranteed result except to continue to fracture Britain with yet another vote. All choices, if these are choices, are very bad for Britain. Their vote will answer this. The British people are in the hands of their politicians; the same collective UK cadre that has, for the past two decades, routinely beholden the UK to an unelected EU central body of monetary, military and sovereign control. The Eight Hundred Pound Corbyn in the Room. Throughout the negotiations, there has at all times been a specter looming in the back of the minds of the Brexit negotiators and particularly in the black souls of Junker and Tusk. Arguably there is a much bigger reason for the failed Brexit negotiations and the final desperate measures of Ms May and her ilk to pass their “deal.” This reason, a voice of reason long discounted like the UK people themselves, now stands larger than ever. One diminutive little man. He stands for what they do not. This politician is pro-UK, pro-worker, pro-Labour, pro- NHS, pro-union, and pro- Palestine. He is also anti-privatization, anti- EU, anti-war, anti-nuclear war, anti-global warming. Worse, he is a devote socialist and a rare politician who publicly holds Israel accountable for its crimes! Yes. Behind all that has gone on with destroying Brexit, there is another nightmare, one that is the Kryptonite that Brussels is terrified of to its marrow. His name is Jeremy Corbyn. However, Brussels is not scared of just the man himself nor his ideals and sincerity to his cause. No. What EU and EUP politicians, those that support all things Zionist, fear the most is his leadership: Unapologetic, populist, socialist, leadership. That is rising. Corbyn is what the United Kingdom once was fifty years ago. During that too-long forgotten time, the workers and their vote forced political will in favour of their country and their families. Politicians feared their vote and Britain slowly reversed the social degradation that was the legacy of the industrial revolution and the engines of capitalism and capitalists run amuck. Corbyn is, and always has been, Old Labour; not the bastardized form that slowly infected parliament under the moniker of “New” Labour over the past twenty years. What hucksters like Tony Blair and the Labour Party elite were, in fact, offering as “new” was really just a quasi Conservative Party light platform that slowly morphed over the years into what the Conservative Party had once been itself under Thatcher and John Major. This left the British voter with the choices of only the Tories or the Conservative Party subsets such as the ineffective Lib-Dems, plus a few non-influential nationalist parties like DUP in Ireland and Plaid Cymru in Wales. Hence, election-after-election, voters continued to see their country gutted by virtue of their own vote due to a lack of true choice or opposition candidates. The ongoing results were privatization, social service cuts, and imposed austerity on the UK majority that saw UK poverty levels skyrocket, as shown by last week’ scathing UN report. Instead, Britain became a haven for the wealthy and their massive tax dodging schemes- as shown by the Panama Papers- as poverty increased under more and more White Hall approved austerity. All pro- EU factions of all UK parties within the Parliament, however, were universal in their excuses and false justifications for their ongoing gutting of what remained of British socialism… election-after-election. Corbyn is real Labour. He is an unabashed supporter of, and a throwback to, a time when the UK was an economic powerhouse, but also had enough for everyone- by law! By all accounts and his consistent thirty-five-year track record as an MP, he is genuine. Minimized by his Labour colleagues and the UK press during decades of Labour Party decline, he has now emerged as the voice of reason, a champion of the worker, formidable in debate with his Tory adversaries and unflappable under the torrent of daily media and cross-bench White Hall criticism. Few remember, as they should, that Corbyn, as leader of the Labour Party, has already survived a very contentious attempt by his own party members and the Friends of Israel to oust him as the leader. His success against this coup strongly shows that he has very powerful and connected political interests behind him: those which have spearheaded his ascent and believe in socialist reforms. They and Corbyn understand the true state and direction of current Britain; about this Brexit deal and about Ms May’s faux negotiations and her treason. They don’t like any of it. To the troika (EU Commission, EU Central Bank and IMF) Corbyn is a much bigger threat than the failed attempts at sovereignty in Catalonia, Italy, Spain, Greece or Britain. Corbyn may prove to be- if he becomes PM- real leadership: leadership worth following. His sincere path to a return to an old-time Labour platform that returns control to the UK worker rather than elite and the powerful business interests is anathema to the capitalist forces ruling the EU. His consistent leadership reminds his growing group of followers, both in Britain and worldwide, of the good old days when the people did matter to their government and when there was enough for everyone- by law! He is a very dangerous man; for his is a message, not just for the UK but one being heard as a rallying cry in many capitalist dominated countries worldwide. If Corbyn comes to power, his will- finally– be the first successful attempt at the return to a socialist Britain; the first non- military defeat for the EU and Capitalist forces worldwide. If he becomes PM, which seems increasingly likely, Corbyn’s example will be closely followed by other socialist national leaders in their own countries- sincerely or not (see: Bernie Sanders) – where the 1% have all the wealth, all the services and all the control over an increasingly impoverished world. Anti-populist forces like the EU have so far globally stopped all forms of democratic expression including those elections that were –temporarily – successful, such as Syria, Yemen, Egypt, Honduras, and Ukraine. So, Brexit and Corbyn must be defeated. While Brexit might be the unintended spark for a desperate world to watch glow, it is Corbyn who holds in his palm a very large box of matches. The Mathematics of Treason: Tithing for Politicians. PM May will not be going quietly. With her Prime Minister-ship, Brexit, EU control over the UK, Tory Control over parliament, and certification of the national rise of socialism at stake, her job is to cajole and lie-again- to an election weary Britain, one that has already suffered the distortions of the Scottish independence referendum ( SNP), the ill-fated Brexit referendum, and then a national election- the one that saw May and her Cons club cling to power only by buying Irish DUP support for UK 1.5 Billion pounds. All this in thirty-three months. The cycle has begun anew. The arrogance of these two statements is as incongruent as it is revealing. Here, Ms. May would actually have the original Brexit voter believe that she has done such a good job negotiating this deal that her current Brexit- which it is not – must now be passed by parliament in order to honor the will of the Brexit voter- which it does not: the same voters that would never have voted for Brexit in the form she has turned it into. Such is the delusion and arrogance of Ms May. Ms May must rely on getting her votes this time from parliament, not the people. She needs 326 votes. Here lies the real threat to Britain. There are 650 seats in House of Common so 326 is the magic majority. In terms of purported party loyalty, the Cons sit with 315 seats and an only coalition majority. But Labour’s opposition and 257 seats are fractured at best between true labour and faux labour members. The Scottish National Party is third with 35 followed by the Liberal-Democrats with 9. The remainder of 31 seats is split between nationalist parties like Ian Pasley’s Irish DUP, (10 seats) which have come out against the deal publicly, but has already shown it can be bought for the right price (1.5 Billion pounds), as in the last election of 2016. The UK public must fear the Cons continued allegiance to Brussels. Yes, many have expressed outrage and insisted that they will not vote for this deal. However, with the Cons not having yet been successfully punished at the polls, it is surely a matter of time before the first defector- after a very lengthy and public set of excuses and self-serving rationale- joins the many other existing Tory yes votes. When that happens the floodgates will open and the defections will pour in for their just rewards to come. So, it is safe to assume that the Cons numbers will swell in support by the time of next Wednesday’s vote. While Corbyn tries to hold ranks in order to achieve the Trifecta of defeating the deal, Ms May’s political future and becoming PM in one blow, there is, however, no chance of party unity on this vote. 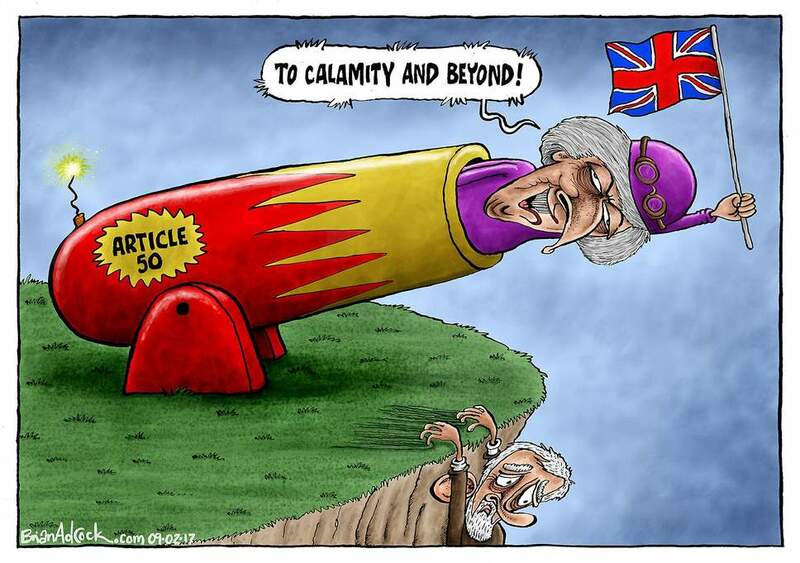 Like the Cons, it is just a matter of time and the next few days before the first public Labour defections and excuses- likely the same ones- “force” that slippery slope towards UK sovereignty to get suddenly steeper. It is not likely that the minor parties will vote for the deal as they are ultra-nationalist, such as Plaid Cymru, since a ”yes” vote will see their platforms as utter hypocrisy and therefore doomed. If PM May and here supporters win, it will be the Conservative Party that will be convicted of the crime. Ms May and the EU can start the count with a firm 90 seats, however. When it comes to UK parliamentary hypocrisy, the leader by far is the self-proclaimed Friends of Israel who are indeed just that. While voting for all things Israel and demonizing all reasonable and factual discussion of Britain’s burgeoning war machine or Israel’s ongoing genocide in Gaza so, they really hate Corbyn. It is fair to say that most will do as they are told and sell out Britain to central control and Zionist EU interests. At this juncture, with a final parliamentary vote only days away, it should behoove the British voter to also look more closely at the failed attempt by Greece to leave the EU and the politicians then, who, in a matter of weeks, also turned tail on their country to also answer a call from Brussels. Brexit, as it stands now before Parliament, is a terrible deal: a deal that is worse than staying in the EU and a deal that will certainly punish the UK- as was the final result in Greece- for its attempt at sovereignty and populist democratic will. For all this, just like in Greece, is anathema to Brussels and just like in Greece the evil of Brussels does not just stop resistance; it puts it down and then punishes such indiscretions economically and brutally afterwards. Such it is today in Greece, as Alex Tsipras, PM in name only, goes hat in hand selling his countries airports, beaches, islands and infrastructure for pennies on the Euro merely to service existing loans from Brussels in order to beg for more. Greece was not a case study in leadership. It was a case study in political treason. Will it be repeated this coming Tuesday! Regardless of the eventual total, what should be a very easy defeat for this treasonous “deal” being sold as a Brexit fait accomplit, like Greece, the final tally may well be a disastrous defeat for Britain. It is likely that all of the UK will be following the final total of the vote. However, the total they should be counting is that of those MPs that turn on them and their country in the lead-up to Tuesday. For, if this deal is passed, it is these faces who must be remembered as the men and women who decided to thumb their nose at the British people and their country. And this they will surely do unless public pressure and outrage- which has not shown itself in decades- is made obvious to them all. Now. The UK’s Telegraph reports 100 Tory MPs have now indicated they will vote the deal down in Parliament. But will they… after the days to come? After Sunday’s EU unanimous vote, Ms May strangely offered to debate her deal for the first time, with Jeremy Corbyn. However, at the same time as the whole of Britain pricked-up their ears at this exciting news, Ms May backed out. Likely because she knows every one of her excuses will be cannon fodder for the Labour leader- and his rise in power. The Express Newspaper polled 3154 British adults about their opinion on the latest Brexit developments and no one is happy. Four in ten (42 per cent) of Britons oppose the deal, whilst only 19 per cent are in favor of it. The remaining 39 per cent answered, “don’t know”. Here, the UK media has done its job via disinformation, thus giving the confidence to those PMs who do vote for the deal, that all will eventually be forgotten, regardless, by the next election. Three of the many events from recent days should tell the UK voter just how important a real Brexit, one that does extricate Britain from EU control, really is and illustrate how much Brussels is worried about the outcome of this vote. One: EU Parliament passed Theresa May’s deal in 38 minutes. It is safe to that Junker, Tusk and their twenty-seven EU brethren members understood the UK Prime Minister’s negotiating style in exactly the same way. 38 minutes? Guess who won these negotiations? Down south, this past week in Italy the newly elected Italian government, led by populist Prime Minister, Giuseppe Conte, and ethno-centrist Interior Minister Matteo Salvini, released their proposed annual national budget. Within twenty-four hours, the EU, Tusk and Junker stated clearly that they were not satisfied with Italy’s sovereign decision on how to spend its own national coffers. The EU demanded that Italy revise the budget to suit their unelected whims. Britains should consider this arbitrary bullying of Italy and of the UK. Then they should consider the sad EU imposed current condition of Greece. Next, they might dwell on the failed outcomes of previous elections within the nearby EU nations, and how similar movements were defeated in their nation as well. Last, they must pay closest of attention to what is actually in the souls of their own politicians and what they truly support. If not these examples, then the UK citizens would do well to look at the state of subjugation, austerity and further poverty in all these countries and their own: the same countries who also saw, so recently, their hopes so quickly destroyed- like Brexit– by the false-flag allegiance of their elected politicians. Then, Britons can collectively bend over-like their politicians- and begin to get used to taking it… themselves! WRB wants your feedback on this important article. This is YOUR world. Stand-up and be counted. It is time! The Patsy stunt double that wandered off the Ab Fab set, is still at 10 Downing and Still drunk. Please pick her up! WRB is your Daily Worldwide News Source. Help Us Grow! Disclaimer: The contents of this article are of sole responsibility of the author(s). Watching Rome Bum will not be responsible for any inaccurate or incorrect statement in this article. Watching Rome Burn grants permission to cross-post original Watching Rome Bum articles on community internet sites as long as the text & title are not modified. The source and the author's copyright must be displayed. For publication of Watching Rome Bum articles in print or other forms including commercial internet sites, contact: Editor-WRB@protonmail.com. www.watchingromeburn.com contains copyrighted material the use of which has not always been specifically authorized by the copyright owner. We are making such material available to our readers under the provisions of ‘fair use’ in an effort to advance a better understanding of political, economic and social issues. The material on this site is distributed without profit to those who have expressed a prior interest in receiving it for research and educational purposes. If you wish to use copyrighted material for purposes other than ‘fair use’ you must request permission from the copyright owner. © 2017 WatchingRomeBurn All right.